View More In Lamp Sets. This is a new popular cosmos Star Projector lamp, it can help you put the universe back home, give you a piece of the sky changes color, without need for hard to find the field, rotating its base, there will be different colorful space, find the constellation that you belong to it. it is not only give your child universal astronomical science and enhance the capacity of good assistants hands, but also give you the couple to create a romantic surprise. 1. Power On/Off: a red button next to the power port. 2. Press A button set the time, 5-95 minutes can be chose, After the scheduled time, the B, C, D button does work. 4. Press C button, control the lighting color and mode (monochrome light or colorful light overlay). 5. Press D button, warm night light mode, can be worked with C button at the same time. You have to press A button, set the timer from 5-95min as your preference, and then other buttons will work. It'll automatically turn off when the time you set is over. If you want to have the light continue to work, please set the timer again. 1. Please do not use batteries and usb cable as power source at the same time. 2. Please take out the batteries to prevent the battery from leaking, if the lamp is not used for a long time. 3. No wall adapter included in the package. Pls pay attention to the voltage if connected with adapter. 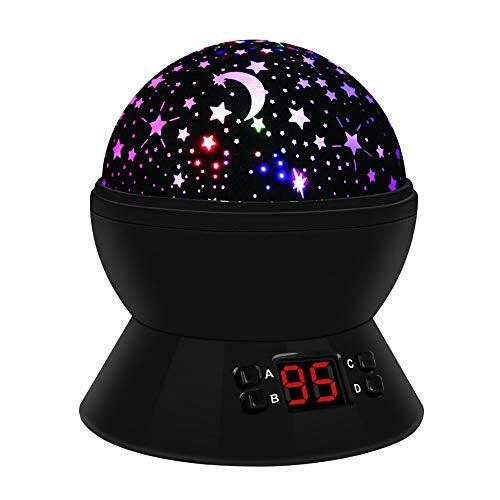 LED timer control: The new generation star projector supports 5-95 minutes to set the time control as your preference that would not disturb you or your baby's sleep and provide a better choice during the baby's sleep time. The lamp will turn off automatically when the set time is ended. Note:Please kindly note that choosing the 5V 1A adapter when using USB cable. Easy to operate with 4 push buttons: Total 5 buttons to control the lamp, Red button: ON/OFF of the whole lamp; A button: control the timer time from 5-95 minutes; B button: control the rotation; C button: control the color conversion, there are 8 lighting modes with different light color combination for your option. D button: warm white table night light mode. Much brighter: The second generation cosmos star projector equipped with 4 pieces more bright LED beads of 1*0.8W warm light, and 3*0.5W colorful light( red light, green light, blue light), operate with C button to get many different combinations of lights, from plain white, to colors, to flashing, and revolving or stationary. Two choice of power: The night light is powered by 4*AAA batteries( not included), or with matched 56 inches usb cable. More convenient, more joy. Beautiful and a nice gift choice: Infant light projector, ideal for decorating birthday, parties, room decor and other romantic occasion. Without need for hard to find the field, rotating its base, there will be different colorful space, find the constellation that you belong to it. Imagine: the light projects moon and stars around your room, enjoy yourself and experience a different starry night. If you have any questions about this product by LBell, contact us by completing and submitting the form below. If you are looking for a specif part number, please include it with your message.